It’s telling that the first thing Big Boi says about himself, outside of his name, is that he’s half of Outkast. Everyone listening knows this, but it says a lot that Big Boi is still defining himself as part of a group that hasn’t released an album in 6 years, and hasn’t released one that people cared about in 9. 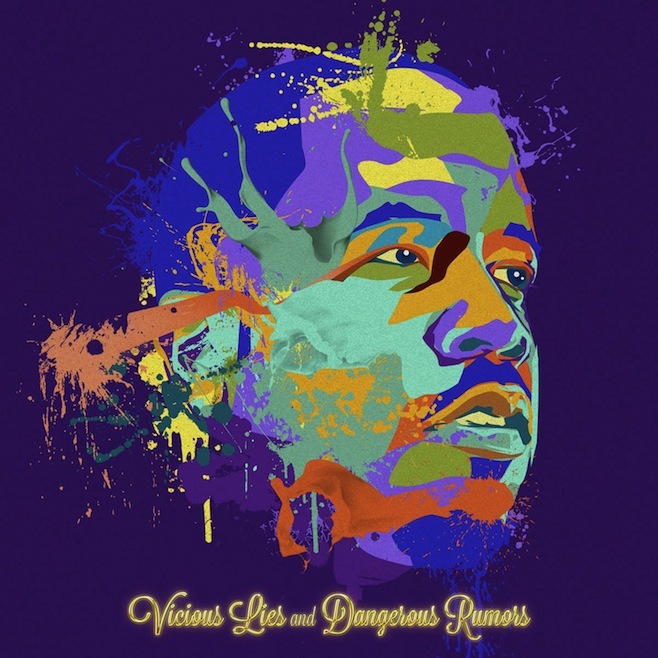 No matter how much time passes, and no matter how much of a compelling case for being a solo artist Big Boi made on Sir Lucious Left Foot, he still feels an absence, and on Vicious Lies & Dangerous Rumors he tries to fill it with everything he can get his hands on, to mixed results. There are two aesthetics on this record, the “80’s in the future” vibe that made up much of Big Boi’s last record, and a moodier sound more in line with today’s indie electronic scene. On their own, both of these styles work quite well, especially on “Mama Told Me”, from the first camp, and “Lines” from the later. Other times the two rub against each other uncomfortably, like on “Objectum Sexuality” where the icy hook provided by Phantogram sounds completely out of place next to Big Boi’s goofy vampire funk voice. The contrast gets even more bizarre when Nathan Williams of Wavves brings in a class of second graders to help him sing the world’s most obnoxious chorus on “Shoes For Running”. Regardless of style, the production never sounds cheap or lazy. The problem is that too many of the songs don’t pop out from the album. What made Sir Lucious Left Foot such a success was how well each of the songs functioned in a vacuum. Many of the songs on Vicious Lies sound like they’re part of a whole, but the big picture itself is missing. The closing tracks in particular sound like the end of an arc that never really began. The best songs on the album are the most singular, like the super villain theme via trap music on “In The A”, which features career highlight verses from T.I. and Ludacris. None of this is meant to discredit Big Boi’s rapping skills, which are highly advanced and utterly unique. Big Boi raps like a slinky, stretching and tightening his flow without ever sliding off beat. He’s convincing at every lyrical angle he approaches whether its braggadocio, relationship struggles, or masturbating on the Internet. Sadly as the album goes on, Big Boi spends less and less time rapping, either letting the hooks repeat ad nauseum, or trading his flow in for a strained singing voice. At times it seems that Big Boi is attempting to be his own Andre 3000, when he’s not getting indie pop singers to fill the role. It seems rude to suggest that one artist needs another to function, but given that Big Boi himself reached out to his former partner for collaboration and was turned down, it doesn’t feel like too much of a stretch. While this record isn’t a failure, it is a significant step down. In attempting to make an Outkast-esque album experience, Big Boi could go half way before running out of steam. At the beginning of the album Big Boi claims that “if you don’t know [him] by now you never will”. As long as he’s standing in the shadow of his former group’s achievements we may never get to know who Big Boi is on his own.